Last fall Elder Gerry Oleman spoke on campus at Brandon University. After my last class of the day, I struggled with whether or not I should bother checking it out because I had errands and needed to make it home on time for Susan to use the car for her weekend classes. Besides, I was exhausted and running on mere fumes of my last caffeine fix–an unfortunate addition to my life since I’ve gone back to school. Since noon, I was mixing up my lowercase Bs and Ds: a sure sign that my brain wasn’t in learning mode anymore. Yes, it was Friday afternoon. In the end I did my drop-off and came back to campus just as Bruce Strang, the Dean of Arts, was finishing his introduction of Oleman. One of the first things I noticed upon entering the He Oyate Tawapi Room, or Ceremony Room, was that the audience and speaker were sitting in a double circle. Earlier, when I was there to listen to Justin Trudeau and Elizabeth May, there was a clear divide between the audience and the listeners. Today there wasn’t even a podium. Gerry’s wonderfully warm talk, titled “Healing the Impacts of Colonization” had a clear structure. 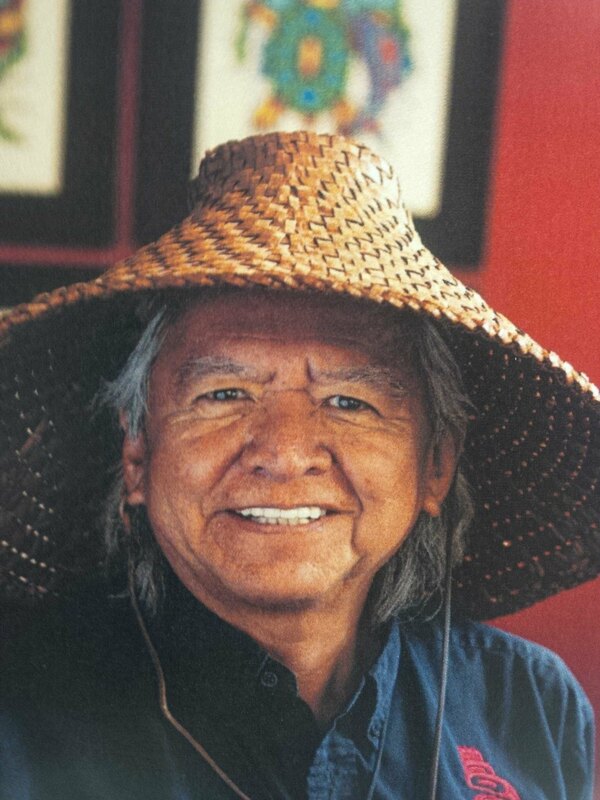 He began by sharing stories from his elders about how his people lived pre-colonization, followed by observing the devastation of colonization. He concluded with a powerful call for healing actions. During the lectures I attend I usually take down quotations on my phone for sharing on Facebook. I have found it a great way to share my experiences with my community and family while I am away from home. Some are direct quotations, others are paraphrases. In some places I have inserted my own reflections. Before we came in touch with Europeans, there was no extinction of anything. My elders tell me you could walk across the river on the backs of salmon. I believe our people are kind and we are generous. We accepted the visitors who came, but never went home. Where ever I go, I tell my people to go back to the old ways. Let’s go home! Before contact there were no degenerative diseases among us. No diabetes, no cancer. We have something to offer Canada. We had powerful healers who could connect to energy we cannot see. As soon as they knew there is a baby in that mother, my grandmother said, “Talk to your baby everyday! You use beautiful words with that baby.” I used the think my granny was superstitious. Now I know better. What is a baby who hears good words from the very beginning going to become? Their mind will be strong and full of love. After the baby is born, the placenta is buried in the earth. “While the baby is inside the mother, she purifies it’s food, she breathes for it, she thinks good and loving thoughts. When we place the afterbirth into the earth we recognize that the earth is now also like a mother who will sustain us, feed us. This ‘guiding thought’ allowed our people to live in a sustainable way. We must honour everything that keeps us alive. Always remember those who kept you alive when you were a baby. Our life was guided by the power of love. The love of power is a great sickness. Oleman said that in his mind, colonization and the problems it brings with it, can be summarized by five Rs. RCMP: The police remain an important physiological trigger even today, because they came with the priests to take our children to residential schools. I missed the 5th R, but I think it was Resources. I can’t blame the Europeans for loving what we had. Lots of gold! By 1945 the average age of the native population was 45. Europeans had introduced alcohol, which our people had never had. I am telling you this, so you can understand why we are the way we are today. Once we understand, we can take action. Finally, he spoke very hopefully and beautifully about healing. As a body therapist, somebody who helps people process their pain and suffering, this part of his speech meant to most to me. I did not expect to see such profound similarities between a Native understanding of healing and my own. I went around complaining, “Somebody should do something!” and then I realized I was somebody! While we are blaming somebody, we will not take action. The word heal means ‘to become original’. Like a baby. There can be an end to the suffering in our mind. The word forgive means ‘to let go’. My belief is that we are still building Canada today! We are still shaping our identity. Will it be an identity of justice? We can use the tools of our past to help people who are suffering. We can’t let people live miserable lives and die miserable deaths! We must teach the right way of thinking. This is our gift to Canada. I stopped watching TV because there are so many bad ideas there. We must revive these ways to help ourselves and each other. Sometimes we just need to listen to others. The word ‘attitude’ means that you act the way you think. If you think well, you will act well. That is the old way. Do not become greedy! The first kill you make, give it away. The first moccasin you make, find an elder and give it the them. I had to give away the first drum I made, and I didn’t want to! It turned out pretty good. But, the first everything, you give it away. Greed hurts people. Do not become attached. One of the first times I visited Anita Schattner, she pointed out a coffee table in her living room. She said that it was one of the first things Jonty Vetter made when he became a carpenter. I remember sensing that this was significant and that it meant something to her. It also reminded me of Marcus and Joseph who recently built guitars from scratch, an instrument both delicate and strong at the same time. What does it mean to part with something like that? Imagine my astonishment when I realized that North American natives were engaging an anti-greed practice strikingly similar to the biblical concept of ‘first fruits’ and the all-important first-born! This was particularly astounding and hits painfully close to home for me as a Hutterite. It reminded me of a comment by a German friend who knows Hutterites from all Leut dating back to the 1980s. He said, “In all my Hutterite experience, I have encountered many strong Hutterite women, but very few strong Hutterite men.” I think of women like my Ankela and mom, and heroes like Anna and Dora Maendel. And I asked who and where are the men in our world making a difference. There are some, but I am disquieted when I realize that too many verpatzl their time and energy with diversions like professional sports, hunting, accumulating wealth, the latest gadgetry, and politicizing instead of devoting their energy to creating a vision for the future and passing on values to a new generation. I dare say that much of the positive Vorschrit my people will make in the next 100 years will come to us by the labour pangs of our women. Thank God for them. Gerry also recounted his struggle in overcoming sexual abuse. While he was still in denial and not on a good life path, he encountered a native healer. She said to him, “You have been sexually abused.” Gerry wanted to deny it, but when she added, “By two men. And they are still inside you.” “Then I knew that I could not lie to her.” Hearing him say that, felt like a cosmic blow to the stomach. He related that as the healer looked at him she saw that “he was burning a hole in the ozone layer”. I know that this may not mean anything to many of you, but in the world of healers it means that his spirit and his body were not one. He was disconnected from the foundational lower half of his body, the part that enables us to live well on earth, because it was causing him so much pain. Ironically, by remaining detached/disassociated, he was, as is the case for all of us, choosing to stay on a destructive path. Only when we acknowledge the pain, can we move through it–true healers teach us too see the reason for our suffering, and help us learn the lesson of the pain. Philosophy is another word for ‘guiding thoughts’. Spirit: the gift that holds our body and mind together. How do you tell if somebody’s spirit is strong? People want to be with them; there is a look in their eye and they are kind. People want to celebrate with them! Just before I left to honour my community commitments, one of the BU students from up north spoke about her experiences at home and coming to Brandon. She said, “Our people are so angry. I am angry. How do we let go of this anger?” She spoke gently and clearly about the hurdles young native people have to overcome. I could hear her sincerity and her pain. While it was moving to see this, it was even more beautiful to see how thoughtfully one of her elders, Gerry Oleman, listened to her. Then I went home. And I haven’t stopped thinking since. Categories: Reflection | Tags: Brandon University, Gerry Oleman, Healers, Healing, Healing from Colonization, Hutterite, Kenny Wollmann, Native spirituality, Residential Schools | Permalink. Och mensch! So much wisdom packed into this post! Kenny, why did you not take me to this event?! “I went around complaining, “Somebody should do something!” and then I realized I was somebody!” How many Hutterites have you heard say that “Es is nix merh in die Gma. Drum ge ich wek.” My goodness, YOU be something! YOU make a start! “Do not become greedy! The first kill you make, give it away. The first moccasin you make, find an elder and give it the them….” This is hard! Really, really hard! I’ve given away paintings that I’ve labored hours over, but not my favorites. And most certainly not my first. But I imagine after the hard part of giving is over, it feels quite exhilarating. “Only now are native students showing up to study at university in BC. The brave ones. But no men! I ask, “Where are the men?” and I say, “It is the women that will lead us out of the darkness!”” What more can I say – I love this guy for being a man who realizes that women can do important things too, something that many Hutterite men are not capable of admitting. Or no?